Compare and choose what is in your best interest with instant QLAC income rates direct from the annuity companies side by side. Developed by a Certified Financial Planner® and Retirement Income Certified Professional® so that QLAC process is transparent and easy with disclosed commissons and costs. See your estimated IRA RMD (Required Minimum Distribution) tax deferral savings from the online calculator. With interactive graphs to see when a QLAC will offer higher total RMD income compared to a portfolio returns. QLAC (Qualified Longevity Annuity Contract) may be the highest income, easiest kind of annuity income that you can buy. Summer of 2014, the IRS and Treasury Department finalized the creation of qualifying longevity annuity contracts, or QLACs, under the required minimum distribution (RMD) rules of Internal Revenue Code section 401(a)(9). Providing an exception to the RMD rules allowing an IRA owner to use the lesser of 25% of account owners total IRA account balance or $125,000 to deferred income annuity or longevity annuity that provides no cash value and promises income payments no later than age 85. This amount was subject to inflation adjustment in the coming years. The only retirement tool that would provide protection against the longevity “risk” and not require the IRA account owner to distribute RMD tax up until age of 85 from a QLAC. 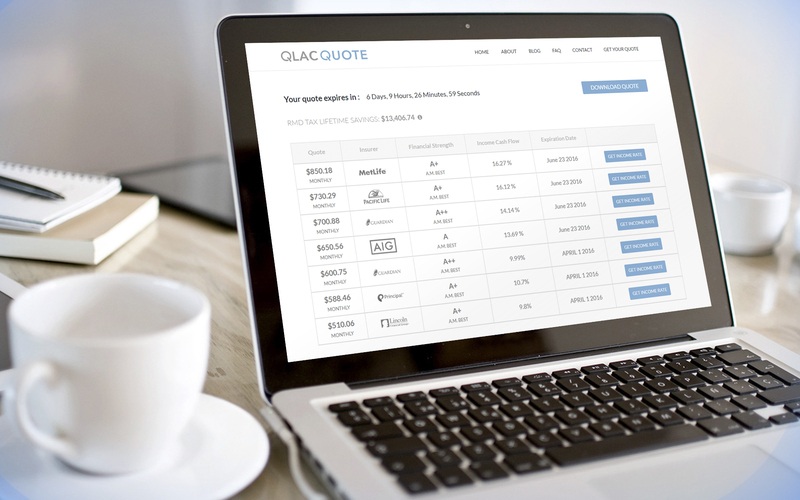 Beginning in 2018 the IRS using the inflation adjustment language updated the qualifying QLAC amount to $130,000.